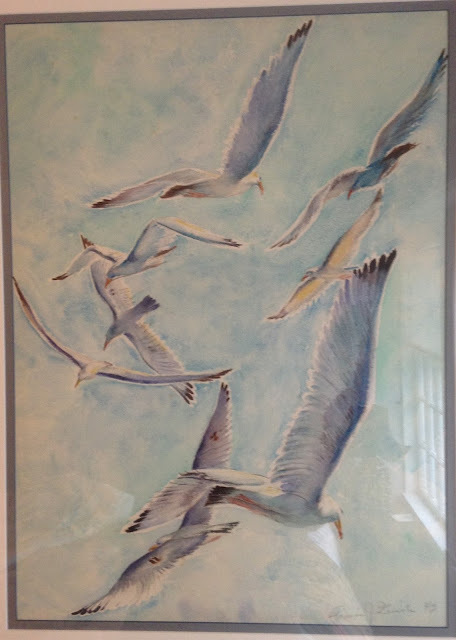 The second painting that recently came to light from a relative of Francis Quirk is a beautiful watercolor of seagulls. Quirk carefully worked the images of many birds in different alignments and positions on a sky blue background. It appears that he decided to work on his depiction of the waterfowl as an exercise and sought to paint them in a variety of postures as an exercise to improve his hand and master painting the creatures. We had always known of Quirk's love of the sea, sailboats and coastal Maine. However, we had not seen a painting quite like this one before. Late in his life, he painted several landscape paintings as part of his Ossabaw Island Foundation Fellowship. Birds appeared in these paintings, but they were largely accents to the image adding a bit of action and life to placid scenes. There was one exception to this which is his painting of glossy faced ibis which we highlight below. Thus, we were a bit surprised to see the "42"date which indicated that the work was executed when Quirk was in his mid 30's. You can see the original post on his Ossabaw work here.